— Brandon Allen had a number of hard-hit line drives in batting practice, and some shots to the gap. Yesterday, he hit a triple to the gap and if you’ve never seen Allen run, he moves really well for a guy his size. That’s all good to see from a player who can hopefully use this Spring Training to springboard a productive year at either Triple-A Reno or in some role at the Major League level. After batting practice, you couldn’t help but notice Allen sit down next to Adam LaRoche in the D-backs dugout. To this point, he seems to be handling his situation exactly how you would hope a young player would, taking advantage of LaRoche’s knowledge and experience. We’ll try to catch up with Brandon at some point soon and get his thoughts on the spring so far. — Billy Buckner settled down after a rough start to yesterday’s game, retiring his last five batters. As I mentioned here last week, he’s one of the guys you should really keep an eye on this spring. He’s fighting for a spot in the rotation, as the fourth and fifth spots both seem to be up for grabs at the outset. — D-backs General Manager Josh Byrnes said today that while the team would like to see Brandon Webb start the regular season right away, the club plans to be cautious and realistic about his bounce back from a shoulder injury. “It’s going to be a gradual process,” Byrnes said. “We’re into games, so we’re starting to think about where he fits into the schedule. We’ll continue to keep him moving along. It’s a long season. If we get 30 starts from him, great. If we get 20 from him, that’s great. We just need to get it right. This might make Buckner’s performance that much more important to monitor, as there is at least some small possibility that it could be three rotation spots — not two — that need filling for early April. — Edwin Jackson will make the start for the D-backs on Saturday in Scottsdale against the Giants. — It was interesting to see infielders Starlin Castro and Josh Vitters, and outfielder Brett Jackson in the lineup for the Cubs today. According to ESPN’s Keith Law, they’re three of the Cubs’ five best prospects, and Castro and Vitters are two of the top 30 in the league. If you’re into prospect watching like me, I’ll post a blog in the next few days with the prospects you should keep an eye on when you attend D-backs games this Spring Training. 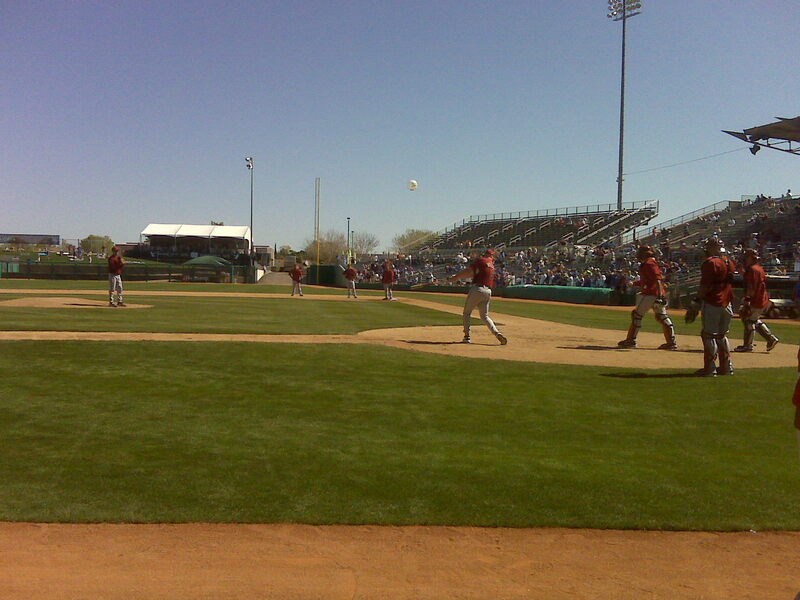 First base coach Matt Williams ran infield practice before the game. 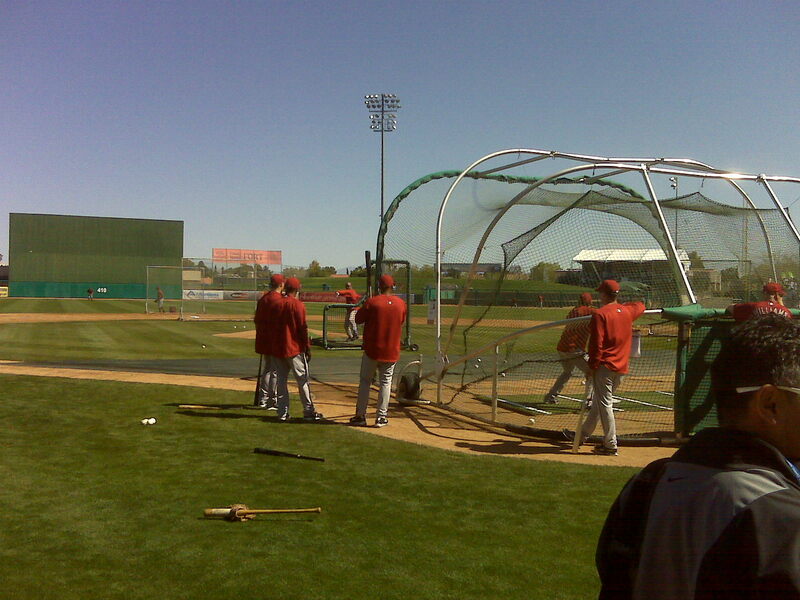 — Justin Upton just blasted a three-run sixth-inning home run off the scoreboard in left field, his first of the Spring. It’s the fifth run the D-backs have scored this inning, as they lead the Cubs 5-4. — Dan Haren had a nice, smooth-sailing outing here in Mesa. Two innings, no hits, one walk, one strikeout. — Ryan Roberts just hit a homer clear out of the stadium, between the left-field foult pole and the scoreboard. 6-4 D-backs in the top of the seventh. — Cole Gillespie just went deep to break a tie for the D-backs in the top of the ninth, 7-6 good guys. Keep your eye on Gillespie, he might contribute at the big league level this year. — Tough loss, with the Cubs winning it 8-7 on a deep walk-off double.